Flottweg offers you an innovative process for high-efficiency algae harvest and oil extraction. Algae are the precursors for many different branches of industry such as the cosmetics industry, pharmaceuticals, manufacture of biofuels or the foodstuffs industry. High yields are based on having the most efficient algae harvest possible. Algae are cultivated in photobioreactors. Following this, the algae are separated from the water. The cell harvest plays a decisive role in determining the efficiency of the algae harvest. 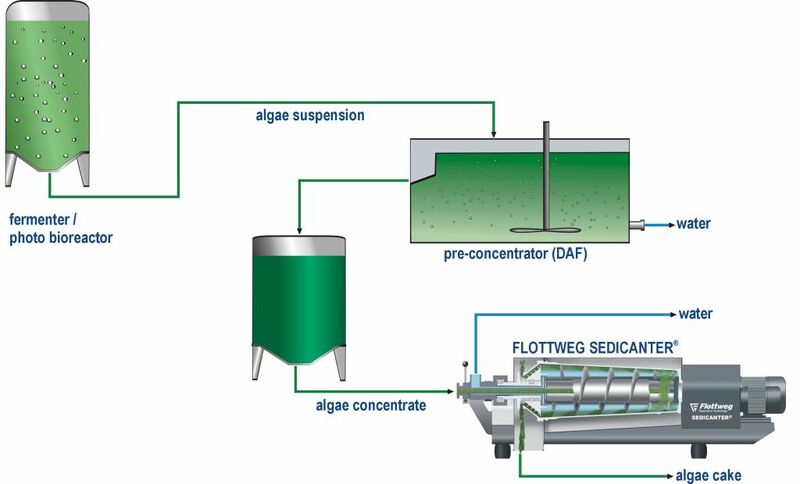 The Flottweg Enalgy process is a highly effective method of algae harvest: Firstly, it is an algae harvest with the separator and, secondly, it is a two-stage process comprising preliminary concentration – e.g. by flotation – and then the cell harvest itself with the Flottweg Sedicanter®. The algae harvest with the Sedicanter® is a two-stage process comprising preliminary concentration by flotation and then the actual cell harvest. The Sedicanter® dewaters the concentrated algae to 22 to 25% solid content. Only this special decanter centrifuge is capable of efficiently concentrating the fine and soft algae cells. This process is suitable for medium to large plants. It is characterised above all by the high concentration of the algae, with a very low energy consumption. In the algae harvest with the separator, the algae suspension from the fermenter is clarified via the separator. The algae suspension flows directly into the separator, where it is separated into a clear water phase and algae concentrate. The algae concentrate then has a creamy consistency. This process is suitable for small to medium plants. The algae harvest using the separator is characterised above all by its high separation accuracy.